Drum loaded into dust-tight glove box access chamber, exclusive hydraulic Lift & Seal SystemTM seals drum to discharge cone, and rotates drum 180°. Active split valve on discharge cone and passive split valve on drum filling system are docked, then locked into position. Once valve docking has been confirmed, the high containment valve is actuated. Product is discharged through milling system into fill drum, where mixing occurs. 316 stainless steel product contact surfaces with 150 grit or better finish. Carbon steel structure with Steel-ItTM epoxy finishing system. Quadro ComilTM dry milling system. Gain-in-weight scale system for precise measurement of ingredient additives. 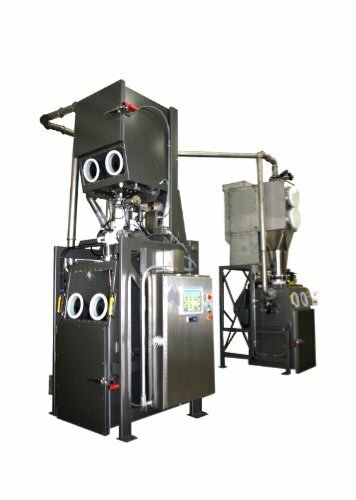 MACTM dust filtration system with pulse-jet filter cleaning. Dust filtration system includes all required actuated valves and modular ducting. Allen-BradleyTM ControlLogixTM PLC with PanelView Plus 1500TM operator interface. HoffmanTM NEMA 4X stainless steel electrical enclosures.